Cameron was spending most of his time in bed, and it was complicating his status on the heart donor list. He was born with a rare condition called transposition of the great arteries - basically, the plumbing in his heart was all mixed up. He had gone through several cardiac surgeries in his life and there really was little else that the surgeons could do except wait for a new heart to come along. The problem was that Cameron was just wasting away in bed, and his inactivity and poor nutrition were complicating his immune status, and this in turn could have potentially compromised his ability to be eligible for a donor heart. So, that is why it was my job to 'de-funk' his attitude – to get him moving, out of bed, and in general help him become more healthy. Cameron's medical history would take volumes to express, although he was only eight years old. His mom, 40-something and living the life of a transient Harley Davidson enthusiast, was really not in a position where she was capable of settling down and taking care of him. Her first marriage was brief and Cameron never really knew his biological dad. She later married a fellow from Arizona, Jim, who apparently didn't approve of her lifestyle choices and they ultimately divorced too. Somewhere in this process Jim took over as primary caregiver to Cameron, but then Cameron ended up in foster care because Jim technically did not have custody, nor was he blood-related. Jim went back to Arizona and lost contact for a while - until he learned that Cameron had returned to the hospital again. Then he packed a suitcase and came to live in the hospital room with Cameron, sleeping in the chair next to his bed, and acting as his parent for months. The staff didn't trust Jim initially. No one seemed to understand why this man would travel all the way from Arizona to stay with Cameron. He was not related to him, had no legal rights, and could not even sign consent forms. Everyone wondered, at length, what his motive was. Jim didn't expect much of Cameron; he just stayed with him. The staff thought it would be good to have Jim out of the room once and a while, so when I arrived I invited him to leave for a break. Cameron refused to look at me. Usually I am capable of engaging kids, but he was clearly not interested in me, and wouldn't even talk. So I sat next to him, and just started chattering - and this is not at all my natural style. "Cameron, since you don't want to talk to me, I will just talk to myself." Then I would proceed to carry on a conversation with myself for the next half hour. Sometimes I would come and read a joke book, laughing to myself. Sometimes I would come in and sing. Sometimes I would come in and play with the toys in his room, ignoring him and not asking his permission. I can't imagine what he thought of me; I am certain that I appeared crazy. Eventually, Cameron started watching me. Then after a while he would try not to laugh at me. Then, one day, he asked me not to leave. After that, we were good buddies. Cameron was in the hospital for months and months. Sometimes his condition would deteriorate and he would be in the ICU for a few days. It was always frightening to see him when he was so swollen up and weak and on a ventilator. But Cameron kept bouncing back. It was hard for Cameron to walk because he was often bloated and barrel-chested and carrying extra water weight - and this was complicated by his decreased strength from being in bed for so long. To complicate matters, his feet constantly hurt him as he had a hard time supporting his own body weight. In order to get him to walk more, I would take him to the floor where the cardiologists had their offices and we would 'sneak' into their rooms and steal their donuts and leave anonymous notes on their desks. It was grand fun. The cardiology staff always made sure to have extra donuts lying around for Cameron, and they never let him know they were in on the charade. For Christmas, Cameron got a wonderful bike that had a molded frame like a motorcycle, and it even made motorcycle noises when you pressed the buttons on the handlebars. I tried putting training wheels on it as he would not have been able to ride it any other way, but it was still too challenging for him. The bike was a major source of frustration, but one day he decided that if he couldn't ride it that at least he could 'spit-shine' it. He spent hours shining that bike, and it brought him tremendous satisfaction. Cameron longed for the outdoors that Spring, and desperately wanted to have a picnic in the woods. Leaving the hospital was not an option, so we just brought the picnic to him. We emptied out a play room, played nature sounds of birds and a babbling brook, had a red-checkered picnic cloth, and packed a delicious lunch of ham sandwiches. It was a big event, as all of his nurses, therapists, and even doctors enjoyed the picnic lunch with him. I will never forget the smile on his face throughout the whole lunch as he watched the event unfold around him that he directed and orchestrated. 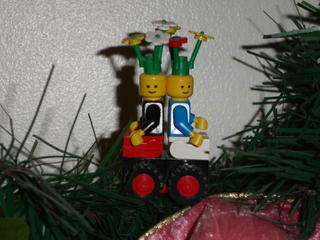 One day Cameron and I were playing with legos, and just chatting back and forth. "What are you making?" I asked him. "Just something that reminds me of us," he said. And then he handed me a small creation. 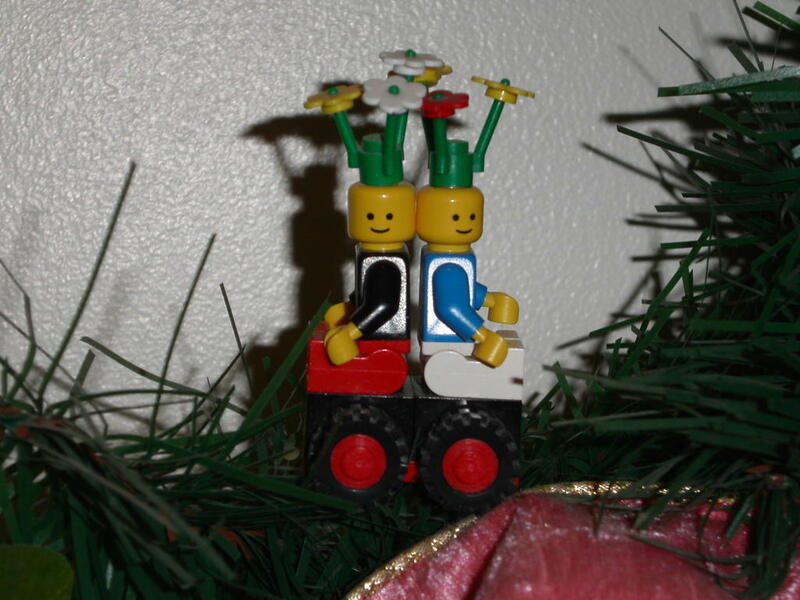 It was a simple base with four wheels on it, just large enough to accommodate two small lego figures positioned back to back in a long sitting posture. Instead of wearing hats or having hair, flowers sprouted from the tops of their heads. He gave this to me many years ago, and it still sits on my desk - unchanged from the original way he presented it to me. Jim still stayed with him for the remaining months, never faltering in his dedicated and selfless support. I suppose that with time people can become cynical, and this is true especially of hospital workers. I am sure that most of the staff never really came to realize that Jim really loved Cameron. He literally dropped his life and came to tend to Cameron. People had a hard time believing that. One day it was evident that Cameron’s condition was deteriorating and that he was not recovering. We watched for a few days, praying that a heart would come available, but it never did. Cameron's hospital 'family' of doctors, nurses, and therapists gathered around him and tended to his final needs. His hair was combed, his body bathed, his hand held, his forehead caressed gently and kissed. Not knowing what else to do, I came into his room, played with his toys, sang to him, and massaged his feet. I remember how cold his feet were underneath my hands, and how I tried to will life back into them. But I could feel that he was leaving his body. Cameron died that night, after Jim stepped out of the room for a moment. There were no doctors or nurses or therapists there. He must have wanted to go that way. The funeral was a blur: hundreds and hundreds of people were there. I remember seeing a little Power Ranger figure someone placed in Cameron’s hand. That is what I remember most, for some reason. Cameron waited and waited and waited for months on end, hoping that he would get a new heart. Somehow he never lost patience and never seemed to get depressed. Cameron, whose heart was twisted and deformed, taught everyone around him about how hearts are really supposed to work.